Our 5-Quart Soup Pot with Lid has gently curved sides that help to keep moisture from evaporating and flavors rich. This handsome piece was designed for stocks, soups, stews, and more, with a generous size to help ensure ingredients stay immersed. The 5-Quart Stock Pot with Lid has gently curved sides that help to keep moisture from evaporating and flavors rich. This handsome, Nambé exclusive piece was designed for stocks, soups, stews, and more, with a generous size to help ensure ingredients stay immersed. 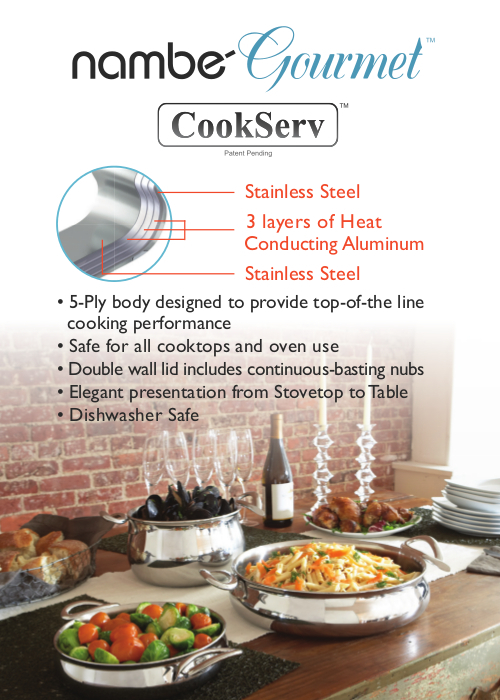 The CookServ collection of cookware is the ultimate blending of artful elegance and high-performance culinary innovations, featuring 5-ply stainless steel construction with and aluminum core for fast, even heat distribution. And with its elegant belly shape and stylish curved handles, this is a piece that can move from the stovetop to the dinner table no matter what the occasion.